What makes Germans tick? That's what Anna Magdalena Bössen wants to find out. 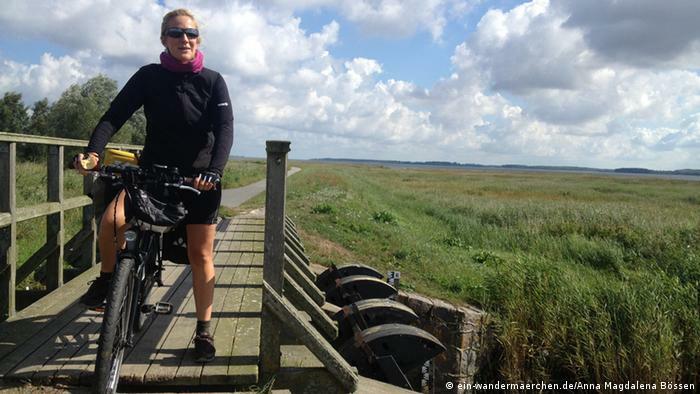 She is biking through Germany to get to know the country better. Along the way, she recites German poetry in exchange for a place to stay. DW: Miss Bössen, you just returned home from a special journey. For the last three months, you biked through half of Germany to get to know the country and its people better. Along the way you recited German poems and literary texts for board and lodging. How exactly can I picture this mixture of a bike tour, reciting literature and couchsurfing? Anna Magdalena Bössen: I am basically out on the road with a yellow suitcase full of German poems. But the great German poets and thinkers are only symbolically in my suitcase. I am a reciter by profession, so I know all of these texts by heart. I have a website with an interactive map on which hosts can sign up and offer anything like a bed, a stage or even just a meal in exchange for my literary show, which is basically a currency, given that I offer something in exchange for people hosting me. What exactly does your literary show entail? On the one hand, my literary show consists of a cross-section through German literature - from classics like Goethe and Schiller to literature written by Germans living in exile during the Holocaust. On the other hand it contains specific quotes by German poets and thinkers who reflected upon what it means to be German. So I recite these German quotes and poems - but not just at the breakfast table. I have an entire stage show. Usually the people hosting me organize some sort of an event, they invite guests, rent a room, maybe even prepare some food. I'd say on average I perform in front of 20 to 50 people. And the program needs a crowd, it's very interactive. It's more than just a reading; it's almost like a play or a cabaret. For instance, I regularly ask: "Would you say you represent Germany?" And then we discuss what it means to be German based on personal stories and the literary texts I recite. How exactly do you discuss the question of what makes Germans tick? My program opens with Heinrich Heine's poem "Germany. A Winter's Tale." The title of my literary bike tour "Germany. A Wanderer's Tale" is a direct reference to Heine's work. The poem is about building a kingdom of heaven on Earth. So I usually open with the question whether it is possible to do that. Most people in the audience say that we already live quite heavenly in Germany but that we don't treat our country like heaven. They all say we have it pretty well here in Germany, especially compared to other countries. One thing most people agree on is that Germans complain too much. So when I ask: "Who here thinks Germans complain too much?" then everyone lifts their hands. But when I ask: "And who of you complains too much?" then no one raises their hands anymore, except for a few honest ones. 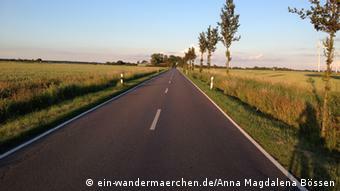 Melancholy plays an important role in German literature as well as your literary bike tour. Do you think Germans are especially melancholic? Germans definitely don't take things very easy. We're not very light-minded and carefree. One woman in the audience once said that what I do is already something very German. I don't just bike through Germany and see where I'll end up staying, I have an overall topic for this trip, I raise philosophical questions on my journey that I try to find answers to. That's of course very German of me, this constant reflection and not taking things lightly. But I think that's also a good characteristic, even though it sometimes holds us back. Is there anything you learned about Germans on your trip that you weren't aware of before? I confirmed something that I was already suspecting and hoping for: There is still a very strong love of literature. 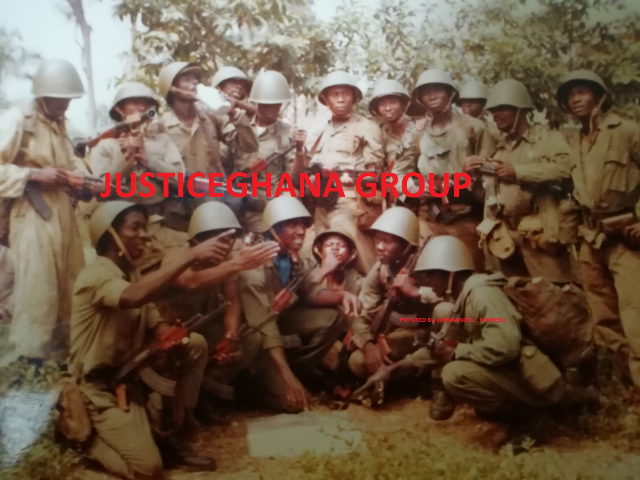 We used to be the country of great poets and thinkers but our history and the holocaust eroded that for a while. Nowadays poetry in school is mainly analyzed and doesn't get experienced anymore. But in order to really feel poetry you have to move away from the analytical side of it. When I recite the poems in a different context, then the audience really gets into the literature and it has a completely different effect. I always suspected that Germans are still excited about literature but I didn't expect that I can really touch so many people with poetry. That makes me very happy. Why did you decide to tour Germany on a bike? You could've hitchhiked or taken public transportation. I'm a total bike person. By mastering the landscape I make it mine. It's a completely different feeling to reach a city on a bike, to pass the very first city sign. I will never forget that the city of Jena lies between beautiful hillsides - because I had to climb them all. And then there is the speed, which is just perfect on a bike. You proceed quickly enough but you still experience everything - from the weather to animals and people. Anna Magdalena Bössen is a 34-year-old speech trainer and founder of the Hamburg city tours "textouren." 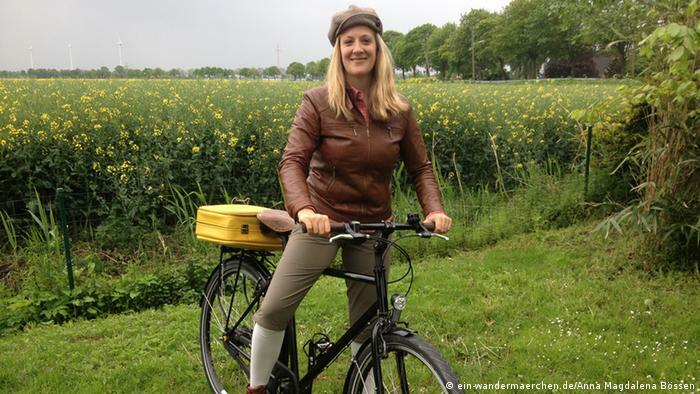 She started her literary bike tour "Germany. 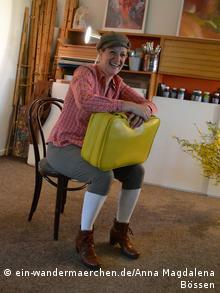 A Wanderer's Tale" in May 2014 and will finish the second half of her tour in October 2015.